a scratch or abrasion of the skin. 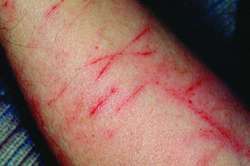 A scratch mark; a linear break in the skin surface, usually covered with blood or serous crusts. /ex·co·ri·a·tion/ (eks-ko″re-a´shun) any superficial loss of substance, as that produced on the skin by scratching. an injury to a surface of the body caused by trauma, such as scratching, abrasion, or a chemical or thermal burn. An abrasive or tearing injury to the surface of the body. n any surface injury to the skin; may be caused by scratches, chemical or thermal burns, and abrasions. Scratch mark; linear break in skin surface, usually covered with blood or serous crusts. superficial traumatic abrasions and scratches which remove some of the skin substance. Commonly caused in animals by rubbing or scratching pruritic skin. A variety of factors make the assessment of excoriation disorder a challenge for clinicians. For patients with SPD with a history of posttraumatic stress and childhood abuse, the causes of psychogenic excoriations can relate to picking as a means of resolving stress or as noted, to some underlying psychopathology (6,7,8). In contrast, with patients who habitually scratch lesions they describe as non-pruritic, neurotic excoriations could be the source of PN, making the nodules less likely to respond to antipruritic therapies. Anxiety, depression and certain personality types have been also shown to be associated with skin symptoms, such as: hyperhidrosis, pruritus, picking or excoriations disorders. Most common complication related to stoma was the excoriation of skin around stoma, which occurred in 20 (58. Reaction has seen everything from verbal excoriation to bomb threats directed at the radio net. But Goldberg said that in the interview, Castro "repeatedly returned to his excoriation of antiSemitism. IN THE UNITED STATES THE UNION MOVEMENT STILL endures a regular excoriation at the hands of the rightwing media any time economic issues come up in the news, but the truth is this emperor not only doesn't have any clothes, he barely has teeth. Signs and symptoms include redness, excoriation, pain, burning, itching, and skin tightness. The most common complications related to established PEG tubes are local infection, skin excoriation and blockages. Secondary bacterial infections may occur if the excoriation is severe. The Eczema Area and Severity Index (EASI) was used to assess four individual symptoms of atopic dermatitis: erythema, induration/papulation, excoriation and lichenification together with the percentage of body surface affected in different areas.